It’s hard to get something right the first time you try it. The New England Patriots had four grueling decades before they won three Super Bowls in four years. Morgan Freeman didn’t land his first major Hollywood role until he was 52. And this is especially true with software, where the stakes are high. Launching a bad product experience can mean hordes of upset customers, lost revenue and, of course, a waste of your team’s most precious resource: time. So to mitigate these risks, we turn to user testing. Whenever you want to design a better onboarding ux, you’ll want to incorporate extensive user testing into the scope of the project. Testing the onboarding ux with real users helped HubSpot achieve a 400% lift in one of its KPIs. It saved the team time, and made the user experience less confusing and more valuable. Get our User Testing toolkit! Including a user testing schedule, interview script, email templates, and more. Don’t have a UX researcher on your team? Not to worry. All you need to know is how to ask the right people the right questions, and you’ll get some important insights that help move the needle. 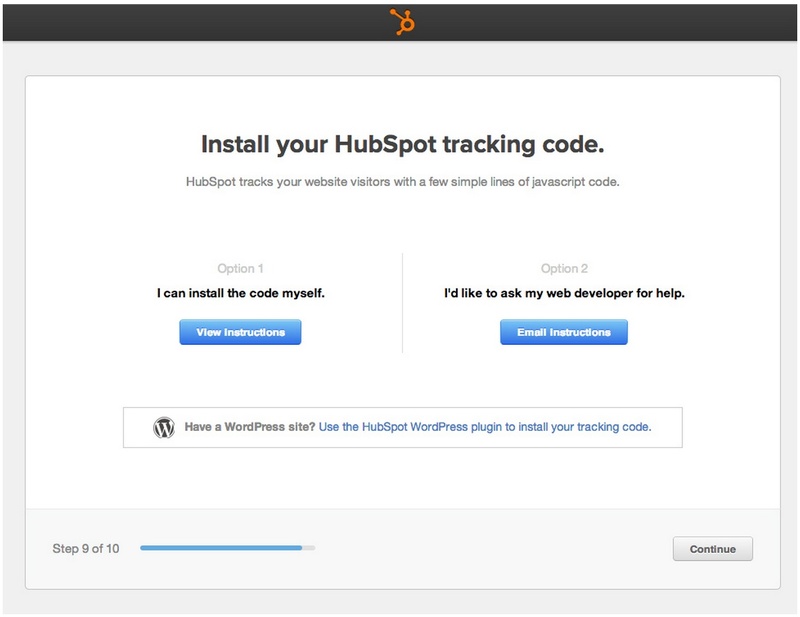 Here’s everything you need to know about how to run an effective user test (and exactly how HubSpot used user testing to get a 4x increase in tracking code installs). If you’re designing an onboarding flow, you have a goal: get the user to complete (at least) one meaningful task in your product. For Twitter, this may be following people the user admires, while for Duolingo this may mean starting your first Spanish lesson. By doing research calls with trial users, we discovered that many of them had no idea what the tracking code was, where to go to install tracking code on their own site, or what the benefit of installing the tracking code would be. To remedy this, we designed a task in the trial onboarding flow that would teach them why this was important and make it easy to get help with installation. 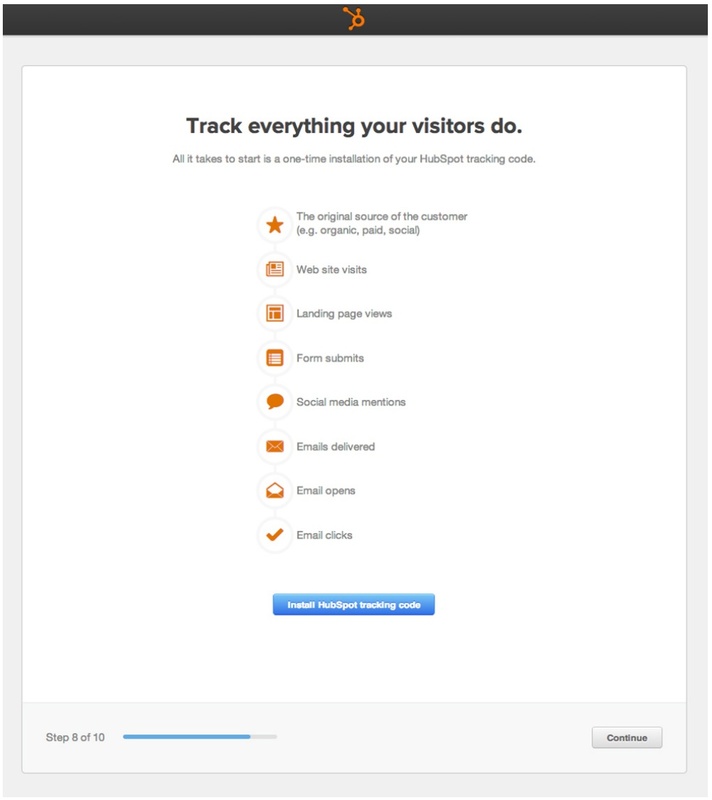 Our goal was to user test this task to learn what was keeping people from installing the HubSpot tracking code, and identify what we can change to increase our conversion between signup and install. If your company has an inside sales team, anybody who is trialing your software is likely already getting inundated with emails. Make it very clear that this is not a sales call. Including an incentive (like an Amazon gift card) and being very clear about the time commitment will improve your odds of getting someone to commit. For any substantial change to your product, like a new feature or a new user onboarding ux flow, we recommend you have no fewer than five interviews. You should keep testing until you are no longer surprised with the results. Surprisingly enough, you can expect a high response rate (about 50%) to these emails, so sometimes it’s best to only send 10 at a time until you have your desired number of tests scheduled. Also, remember to follow up after a few days to those who haven’t responded - you’d be surprised how many appointments get scheduled after a second attempt. At HubSpot, we schedule these calls virtually and use WebEx to run them. There are other software options that will work, but you should look for one that has screensharing, recording and chat capabilities (as well as the ability to switch who is sharing the screen). If you are doing in-person interviews, download Steve Krug’s in-person planning checklist. How did you find out about HubSpot? How would you explain HubSpot to a friend? Do you have someone dedicated to marketing or with a marketing background? Are you considering hiring someone for this? Are you familiar with inbound marketing? Have you done any learning on this topic? Why did you decide to start a trial? 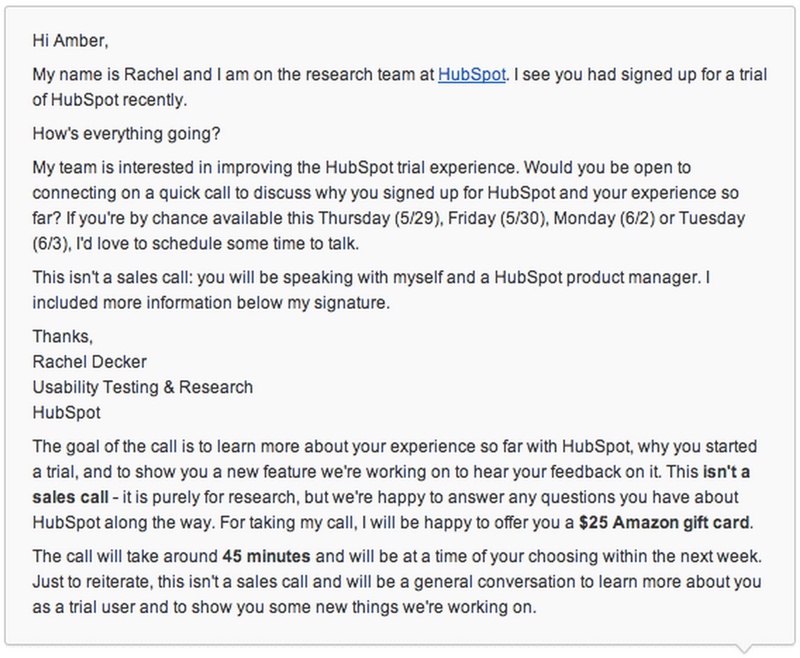 What expectations did you have about what HubSpot is? Did the trial match that? What have you done with HubSpot so far? What value have you found in HubSpot? Why haven’t you come back in to your trial? Notice that most of these aren’t yes or no questions. They are open-ended and designed to get the person to open up about their experience and expectations. Record the session so you can share the observations with your colleagues later on. Encourage the user to “think out loud”. You want to hear everything that goes through the user’s head when completing the tasks. Tell the user that you are testing yourself and your designs, NOT them. Put them at ease and let them know they cannot do anything wrong. Get every user to go through the same tasks without your help. This allows you to aggregate your findings and agree on design changes with your team. Once you’re ready, share the task with your user and ask them to share their screen. At HubSpot, we give users clickable wireframes made with InVision. But for you, this could be a staging version of your software or even hand drawn mockups. With each new screen or step in the task, first let the user think out loud and make note of his or her initial impressions. If you think there’s more to learn, there are some questions you can ask (see the user testing toolkit above). Once you’ve gone through all the tasks, wrap up the interview. Let them know that they’ve reached the end of the tasks, that their feedback was incredibly helpful, thank them for their time and say goodbye. Shortly after the interview, don’t forget to follow up with a thank you email and promised gift. “Oh I don’t have a web developer, I can’t [install the tracking code]!” - This user wasn’t familiar with the term “developer” and used “webmaster” instead. “This is cool! 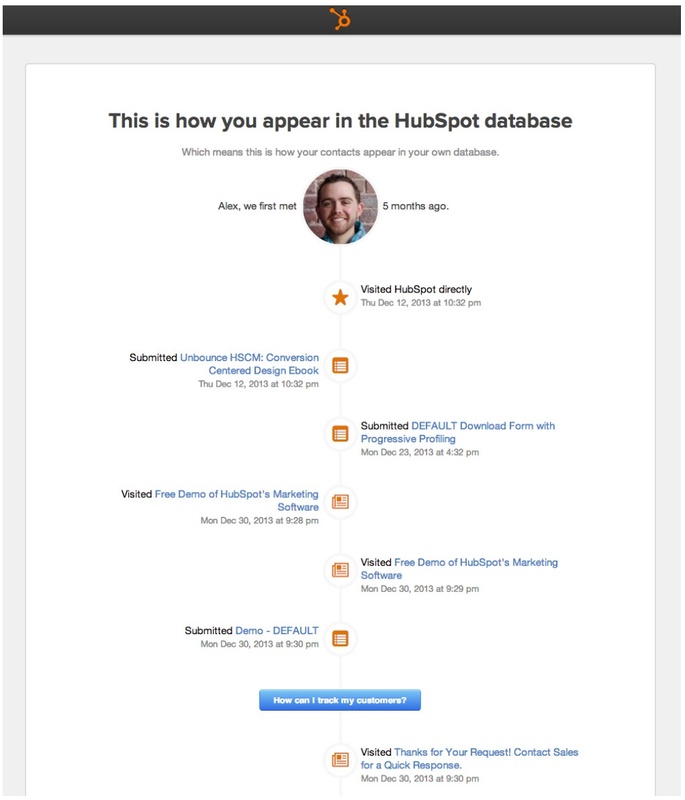 This is all the stuff I did on HubSpot.” - Indicated that the contact timeline we showed made sense to this user. You don’t need a lengthy write up on the findings. Just get your team to agree on what the most important takeaways were, document them, and decide on next steps together. Here is how we document our user testing results at HubSpot. Users didn’t understand the value of the contact timeline until they saw their own data on it. They understood it most when the timeline information related back to the original goal of why they started a trial in the first place. Code is intimidating. We needed to make it as easy as possible for the trial user to send the tracking code to the appropriate person to install via email, and explain the value of the code to motivate users to do so. If people got stuck right away, they didn’t want to spend the time to figure it out and wanted to quit. We made our copy incredibly clear that the tracking code only has to be installed once. We also made our onboarding flow longer with additional benefits of installing the tracking code. We asked users to install the embed script right after showing them these benefits, and gave users the ability to email the embed script to another person on the team. The email contained text explaining why this is important so the developer is more likely to install it. After making these changes, we shipped a variation of the below screens and saw a 400% lift in the number of tracking code installations after one week. All because we solicited feedback on a design before building it out. Now’s the time to try your hand at user testing your onboarding ux flow. Start with designs, call trial users, and get feedback! Use that feedback to make something even better. You won’t get it right the first time, and maybe not even the 10th time, but keep trying. We’d love to see what you come up with. This lesson was written by Rachel from the UX Sisters, a duo of UX researchers at HubSpot who share some incredibly helpful lessons on their blog.